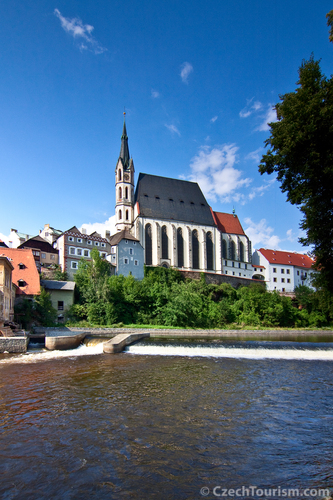 St. Vitus church was built on the promontory created by the river Vltava as well as the Cesky Krumlov castle. Their towers characterize features of the town. The church tower stands for the might of the holy Christendom and the castle tower personifies the secular ruling power. The St. Vitus church is the church of the hall type. The east to west length of the church is 44 metres. It is about 20 m wide and 20 m high. The main hall of the church has a tracery vault in the �parlerian� style that reminisce the St. Vitus Cathedral in Prague. The Parish of Cesky Krumlov was established around 1317. Original church was too small, so Petr I von Rosenberg decided to build a building of larger proportion. The work on the new building began 1340 under the directives of the German builder Linhart of Aldenberg. Later a local building master Stanek of Cesky Krumlov carried on an extension of the church. Under rule of Jindrich III von Rosenberg the reconstruction of the St. Vitus Church was carried out in a very noble-minded style. The building of the church was long lasting proposition, financed even through public collections supported also by the Archbishop of Prague. 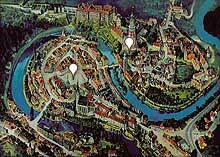 It was completed after the Hussite Wars (around 1439). There was no more significant reconstruction, only in the 19th century the baroque tower was replaced by an eight sided neo-gothic tower. The interior and the inventory of the church are neo-gothic. The main altar has a painting of St. Vitus and the Virgin Mary. The side altars are neo-gothic too. There is an altar of Frantisek Xaversky (left side), altar of Virgin Mary, St. Wenceslaus altar and St. Florian�s altar. On the left side of the left colonnade is situated a chapel of St. John of Nepomuk. The chapel was built during 1725/6 by the first Schwarzenberg pair living in Cesky Krumlov � Adam Franz of Schwarzenberg and his wife Eleonora Amaila. They had often prayed at the tomb of St. John of Nepomuk in Prague until their son was born. Following the birth of an heir, the Schwarzenberg extended the saint an extraordinary devotion. The altar in the St. John Nepomuk chapel was built up in 1725 in the Rococo style. A sober golden plated ornament contrasts with the dark background. The altar is a replica of a similar altar of Bernini in Rome. Near the entrance of the chapel are two gravestones made of red marble originating in the former sepulchres of Wilhelm von Rosenberg and his wife. In the chapel are buried the hearts of some members of the Schwarzenberg family. In the 19th century the chapel was enriched for a relic � a portion of an elbow bone of St. John of Nepomuk, placed in the silver reliquary. The Resurrection chapel is a confirmation of the gothic building period of the church. It grew up at the time of the church�s consecration in 1439. The Cesky Krumlov Archdeacons were led to rest there. The chapel repainted Frantisek Jakub Prokys in 1777. There was still third chapel on the western side of the church. It was called the chapel of St. Jeronimus and it served mainly to German speaking worshippers. The chapel was used until 1787, when it was closed and sold off (today the house Kostelni no. 161). The frescos on the wall next to the St. Jan of Nepomuk chapel originated in the first half of the 15th century and picture the scenes of the Crucifixion, St. Veronica, St. Elizabeth, St. Magdalena and St. Catherine. On the western side of the church is a late gothic choir parapet, below we find a baptism fountain adorned with red marble columns and umbrella originating from the 16th century. Three confessing baroque booths are situated in the rear. There used to be a cemetery around the church. It functioned until 1585, when the town afflicted an epidemic of bubonic plague. In this time the cemetery was removed into a neighbourhood of the Jesuit garden and St. Martin�s chapel. St. Vitus church in Cesky Krumlov is today used for religious purposes. Also classic music concerts are occasionally held here.